On December 4 the NYC Department of Consumer Affairs (DCA) will begin enforcing new rules regarding car wash licenses in New York City. After some back and forth over the last few months regarding the bonding requirement for car wash businesses, the rules were finally set out in the beginning of September. Now, car washes in NYC need to get licensed and obtain a car wash bond in order to be compliant with the new rules. Read on for a breakdown of the licensing and bonding requirements, and for more information about the cost of this bond. According to the Car Wash Accountability Law, a car wash license in NYC is required if a business cleans vehicles (by washing, drying, vacuuming or polishing them, for example) or offers other types of cosmetic care services for vehicles. Previously, car wash businesses in New York needed to post different bonds depending on whether they were unionized or not. Unionized shops had to post a $30,000 bond, whereas non-unionized washes were required to post a $150,000 bond. In May this year, District judge Alvin Hellerstein struck down the Act, because of the pressure that this requirement exerted on car wash owners who were not unionized. He later reversed his judgment but ruled that all car wash businesses had to obtain a $150,000 bond, regardless of whether they were unionized or not. The only exemption to this requirement, currently, applies to businesses who have “entered into a settlement with a state or federal government agency and are covered by an active monitoring agreement”. Only those businesses can post a $30,000 bond. Judge Hellerstein’s decision to re-introduce the bond requirement was criticized by Car Wash Association Attorney Michael Cardozo who said: “We respectfully disagree with the judge’s decision on the $150,000 bond issue, and are considering our options”. NYC Mayor Bill de Blasio, on the other hand, applauded Hellerstein’s decision, saying he considered this a victory for workers and consumers. Whether the Car Wash Association will legally challenge the requirement remains to be seen. Until then the requirement remains in full force. Apply for your car wash bond today and lock your rate for 90 days! Surety bonds are financial guarantee agreements that are conditioned to protect the public and the state from violations on the side of a bonded party. The bond requirement for NYC car wash owners is intended to protect the public and the city of New York from cases in which a car wash violates the Car Wash Accountability Law. In particular, the bond agreement is conditioned to offer compensation in cases in which a car wash must pay obligations, penalties or fees to the city of NY but has not done so. The bond further covers instances of damages caused to consumers’ cars who have used the services of a bonded car wash. Finally, the bond also covers employees who have not received their wages or have received lower wages than they should. In all of the above cases, a complaint can be filed with the Department of Consumer Affairs, which can then file a claim against the bond, requesting compensation for such violations, up to the full amount of the bond. When the surety which covers the bond extends compensation to claimants, the car wash owners must repay the surety in full for such compensation. There is a difference between your surety bond’s cost and its amount! See below for an explanation. The cost of your bond is a small percentage of its full amount. That percentage, or rate, is determined by the surety on the basis of an applicant’s credit score, as well as other relevant financial information about them. Typically, the higher an applicant’s score, the lower their rate. Applicants with a high credit score can expect to receive a rate that can be as little as 0.75% – 2.5% of the full bond amount. For example, if you are offered a rate of 1.25% for your $150,000 bond, you will be required to pay $1,875 to get bonded. 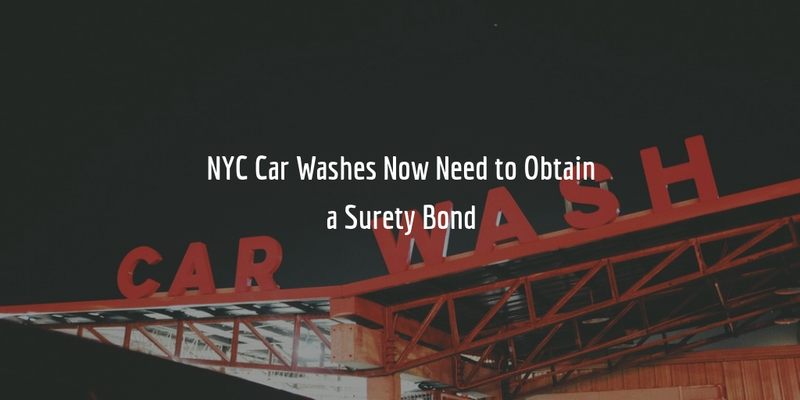 Do you have any questions about this bond or the bonding requirements for car wash owners in NYC? Call us at 877.514.5146 to speak to one of our experts about this.